Despite its humble origins in Hamburg, Germany, the burger has become synonymous with the United States. But what if I told you that New Zealand loves its burgers just as much as America, and has an illustrious list of esteemed burger joints serving up steamy and creatively dressed burgers to prove it? Well, you better believe me, because I’ve been there, eaten the evidence and am now carrying around the extra pounds to prove it. It’s true, and no trip to New Zealand is complete without feasting on a burger or a few, and while odds are you’ll get a good version almost anywhere, there are a few Kiwi burger joints that are guaranteed to give you a real taste of down under flavor, oftentimes full of toppings that will both surprise and delight your taste buds. We might as well start with the most famous, and I’m not speaking in hyperbole when I say many people count a trip to Fergburger as the highlight of their entire time in New Zealand. Located in the South Island’s ski-party town of Queenstown, Fergburger was launched as simply a place for revelers to get a decent late-night bite, but has grown into an absolute icon. Open from 8:30 a.m. until 5 a.m. each night, the vibe here feels downright festival-like, with exotic burgers served on homemade buns like the Tropical Swine (New Zealand beef, bacon, cheddar, salad, and pineapple) and the Little Lamby (New Zealand lamb, mint jelly, salad, aioli and tomato relish) satisfying the hungry crowds until sunrise. With over 50 locations throughout New Zealand, you’re never far from a Burger Fuel and its slightly irreverent attitude towards gourmet burgers. The slick retro-futuristic shops are full of shiny metal counters and the glow of purple neon, but it’s burgers like the Bio Fuel (grass-fed beef, egg, raw grated beetroot with chia seeds, salad and aioli) and the B*stard (grass-fed beef, melted cheddar, bacon, raw grated beetroot with chia seeds, juicy mango, smashed avocado, salad, relish and aioli) that will leave you thoroughly impressed. 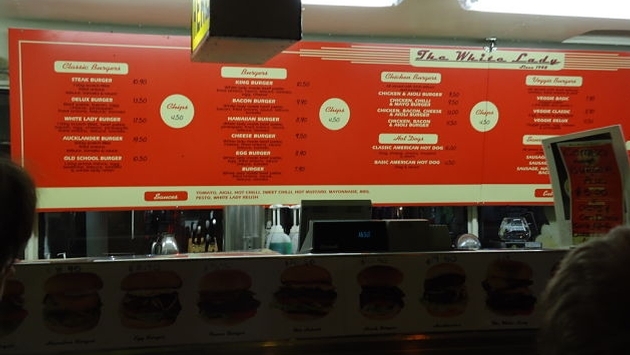 As if an In-N-Out Burger was put on wheels and rolled to the center of downtown Auckland, the White Lady is legendary for serving up old school beef patties and milkshakes, just like the iconic American chain. This neon-bedazzled food truck sets up shop each night (24 hours a day on the weekend), whipping up classics like a simple-but-succulent steak burger to its signature White Lady Burger with melted cheese, bacon, grilled pineapple and fried egg. It’s been doing roaring business since 1948, and one trip will show you why. If you were thinking that this list was missing a place that pairs burgers with brews, have no fear, Smash Palace and its craft beer is here. Making from-scratch burgers and then serving them beside local beer and wine, Smash Palace has quickly become one of Christchurch’s coolest hangouts. Their signature plate is the Bodgieburger, (beef, cheese, lettuce, sweet chutney, mayo, beetroot and egg), but the menu is full of great takes on the Kiwi burger, all pairing perfectly with one of the eatery’s craft pours. Born and raised in the USA but now based in England, Scott specializes in European travel and under-the-radar destinations around the world. He makes it a point to indulge in the local food and drinks wherever he goes, preferably at a festival or while watching a local sports team in action. His work has appeared in US News & World Report, Huffington Post, and World's Best Bars. Stick around, he's going places.